I think any change is stressful, and moving is one of the most stressful changes. As we are moving on Sept. 17 it is crunch time for us. We are short boxes but will try to get some more. We have a lot packed, but even more to pack. I think that is normal as well. So what is making our move so stressful? Well the biggest thing for us is money. We are waiting on a cheque that was to be here last week. We spent our money on things we had budgeted, expecting the check to get here in time. Now there is a question about if the cheque was even mailed. Great. One week to the move and we have used all our money and still have things to pay for. 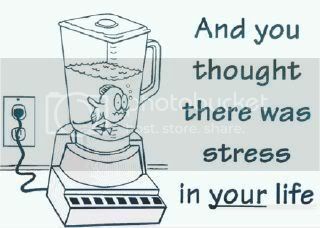 That is very stressful. We have a festival two days before the move, getting ready for both has been a lot of work. We had arranged for the use of a van for the festival about 3 months ago, and last week all of a sudden some one else is using it. We were paying for the use of the van so I am not sure what happened there. So we had to book a rental truck, and now because the cheque has not arrived the money we need to pay for the truck we don’t have. If we don’t have the truck, we cannot do the festival and there goes the money we were expecting to use for the move. We are lucky that we already paid for 1 trip with the moving people, however if a second trip is needed we have to pay another $100.00. If the cheque does not get here in time we are going to have to leave some big things behind like our couch and chair so we can make sure the important stuff gets to the new place. We expected to have to do this in two trips so we are expecting to have to figure out some thing. If some thing can be taken apart and made smaller, we are doing that. If we had known this was going to happen we would have gone threw our clothing before packing it, and got ride of any thing that did not fit, or clothing our kids had almost outgrown. I figure if worse comes to worse we will leave some of the smaller stuff behind and use the bundle buggy and walk it over. That is just going to take a lot of time. I hope that cheque shows up in the next day or so. It is killing us having things up in the air like this. We had a stove all ready, and then last week we found out that some one else got the stove. It was given to them in error, but that does not help us. Now we are going to be ok because at Canadian Tire we bought a BBQ for $16:00 and tax and the adapter for $15:00 so we can use full size propane tanks with it. That will do for the next month or so. The big expense was the two-burner hot plate we picked up from Canadian Tire. As I am used to only being able to use one burner it is not going to be to bad. We already use our little toaster oven to do roasts and such, trying to keep the heat down. So not having an oven is not going to be too big of a deal. I will miss Pizza though. We tend to do a lot of pasta casseroles, and I gave away our slow cooker last year so we are going to look at getting an inexpensive slow cooker to do casseroles in. We will work around this. We have survived worse then not having a stove. What we don’t have is a fridge. And let me tell you after all the problems we had over the last three years with the fridge here we want a new fridge. We are suppose to get a small bar fridge to do us until we get a full sized fridge. However, seeing as this is from the same people who gave the stove away I am not expecting it. It is a good thing we have our own freezer and some coolers. It will work out no matter what happens. We had budgeted for the fridge, out of the cheque that has not shown up. Sears is having a big sale on fridges and we are waiting for some coupons from Sears for even more savings. James has a Sears card, so we will just try to get the 24-month payment plan so we can get a fridge soon. Mind you we are waiting for the coupons to show up in the mail, like the cheque. We don’t have a washer and dryer and I don’t think we are going to have the money for them any time soon, even used. We had expected to be able to get them, or at least a washer but that is just not going to happen. I was hopping for a dishwasher, even a used one for Christmas but I think that will be some thing for next Christmas. Things like a fridge and a washer have to come first. We also got a call from FedEx; we have to pay the $387.00 for the Indonesian Customs from when our ring was stolen. So they want us to pay $90.00 for the next 4 months. It is going to be hard as that is 1/3 of our spending money. We are just going to have to cut back a lot and hit the food banks for the next few months. We just cannot afford to have this bill go to collections. So that kills most of our plans for the next few months. We have been stressed out to the max and it is having a bad effect on our kids. We are short tempered and well we are just not a lot of fun to live with right now. Our kids are stuck dealing with us. They are starting to act out in response to our stress and their own stress about the move. It is just making things harder. I just want the move to be over and done with for every ones sakes. It has not helped that both kids have been sick on and off the last few weeks so they have been home most of the time we have been trying to pack. We expected them to be at daycare and we could just spend days packing. That has not happened. We have all been fighting a flue. And to top it all off, I have lost the use of my right arm/hand due to a repetitive stress injury two weeks before the move. I could not use the computer for a bit, or type one handed, the hen peck method. I am not suppose to be using it right now. So now James has to do the packing, the cleaning and well most every thing as I am very right handed and have a hard time using my left hand. To top it all off my son and I both came down with pink eye on Sat. morning. What fun we are having. The point of this blog. To get it off my chest. I am so stressed I had to do some thing and some how running down the street screaming and pulling my hair out did not seem to be a productive thing to do. I need to distress so I don’t get so upset with my kids and hubby and I am hopping it helps. So far it has in one way, but at the same time it just makes me want to cry. So if any one can send us good vibes or well wishes please do so.